The Eiffel Tower Viewing Deck is open daily from 10 a.m.–1 a.m.: daytime hours are 10 a.m.–5:59 p.m.; nighttime hours are 6 p.m.–1 a.m.
Few views of the Las Vegas Strip are more spectacular than those from above. And, with 46 stories and a 360-degree observation deck, the Eiffel Tower at Paris Las Vegas has some of the best views on the Strip—even capable of rivaling its namesake (at half the size). 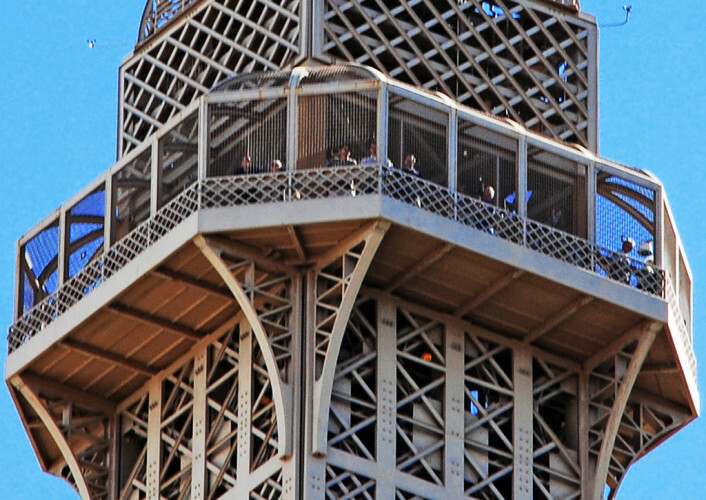 Visitors to the replica tower ride the glass elevator up 460 feet to see the city's landmarks during the day or admire the iconic lights at night. The 11th floor, meanwhile, houses the Eiffel Tower restaurant, which offers a romantic dinner experience, and a nearby kiosk captures commemorative photos and proof that you're not a ghost.